St Agatha’s Catacombs in Rabat are locked away behind a great iron door down the bottom of a flight of steps, available to see on a guided tour only. I was somehow first down the steps and first into a tall arching space with frescoes all around it. An extraordinary, evocative space that deserved more time, more darkness, no reminders of modern tours. We needed time to piece together ancient faces. We were not so lucky. This is the picture I might have taken had there been photography allowed, but it was darker. Strong tradition holds that the young virgin, Agatha, sought refuge on the island of Malta, so as to escape the persecution of the Emperor Decius (249-251 AD) and the Governor of Sicily, Quintinius, who had fallen in love with her. Agatha is said to have lived in the city [Melita], but used to come to pray at this place. A few months later, she returned to her native country, where she was tortured and killed because of her faith on 5th February 251 AD. 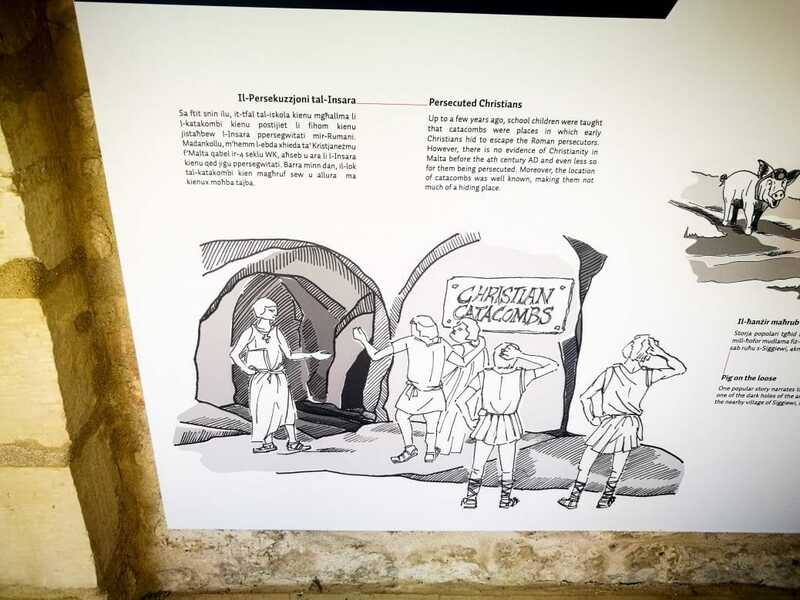 Christians did not hide in catacombs not least because they were terrible hiding places, and there is no evidence for Christianity until the 4th Century AD. Distinctions between the rich and the poorer members of the congregation during these banquets became customary, and so they were stopped. 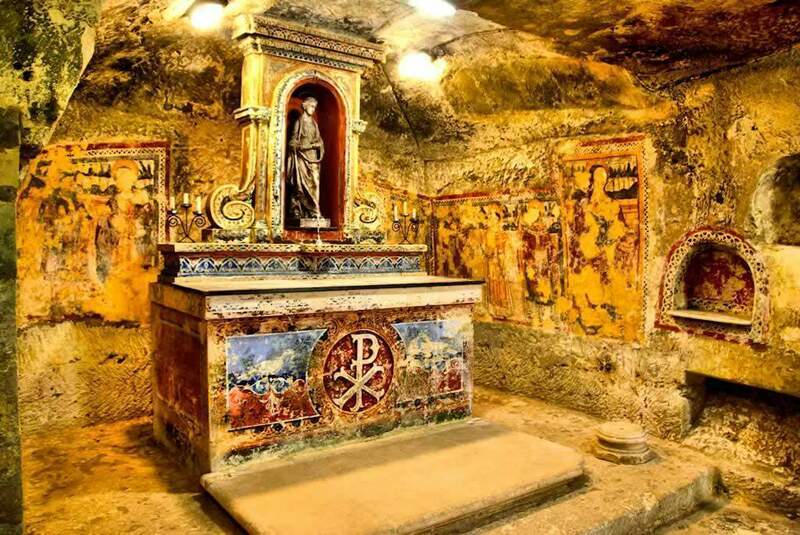 The whole catacomb distinguishes between rich and poor — those with central tombs custom-cut into rock, surrounded by four pillars and passageways to be freestanding. The poor left to shelves in passageways, pits in floors, graves used over and over. But the fresco here is lovely, one of the best preserved. 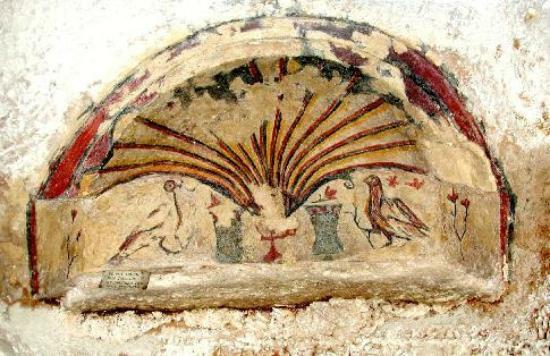 Definitely Christian with the Chi Rho and the vases and the doves — unlike the mutilated stibadium (Bonanno’s preferred term, he mentions mensae and triclinia), which have been found more widely in Libya and Petra and probably tie back to a longer lineage of pagan worship. Many of those here in Malta are not associated with Christian iconography at all (though that doesn’t mean necessarily that they weren’t Christian), and several come with with carved menorahs making them fairly necessarily Jewish. Bonanno does not mention this as an early rock-cut church, nor this as the niche above an altar, either. But these spaces are still very full of an awe closely related to religious feeling, even in modern-day electric lighting rather than flickering oil lamps. How to differentiate between church and religious space holding believers? 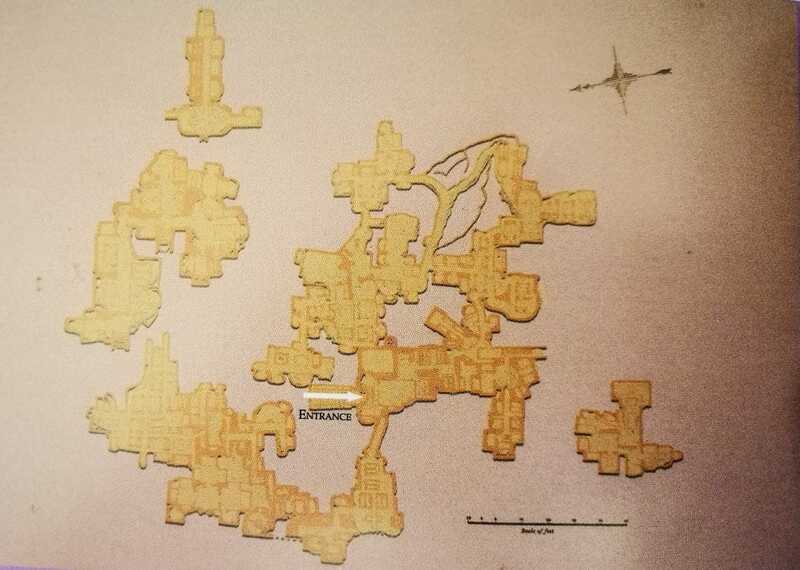 A map here, from Bonanno. There is a museum here also, which reminds me of Victorian days of glory, full of finds from the catacombs but also multiple donations, unprovenanced, uncertain. They range from pottery to fragments of scupture, Egyptian shabtis, bits of glass and beads. The connection to a Hellenized Egypt feels quite strong here. Animals — including the legend of the pelican who causes her own breast to bleed to feed her young. This is everywhere in Medieval English carvings as well as in one of the frescoes decorating a grave in the catacombs below. Though of course, the most amazing thing had to be the 4000 year-old mummified crocodile identified with Sobek, Lord of the Nile.